OPC has designed a full-function beam director with acquisition, tracking, pointing and steering functions for a high energy laser (HEL) phased array system. The design significantly simplifies the design of HEL phased arrays by presenting a complete beamlet tracking and steering in an extraordinarily compact design. A full 50 cm diameter beamlet array steerable over a 100 degree cone takes up a volume of only 0.037 cubic meters. Moreover, given the thickness of the beam steering unit of only a few centimeters, the beam director can transmit out a window only slightly larger than the laser beam itself, even over a 120 degree cone of regard. This window can be curved to match the contour of the aircraft to minimize aerodynamic drag and turbulence. Additional advantages are that the beam director works identically on all polarization states, has an area fill factor around 98%, and eliminates Venetian-blinding phase shift between beamlets due to a fast-slewing target. Placing a high energy laser (HEL) weapon system into a submarine mast offers substantial covert offensive and defensive capability. A mast-mounted beam director that steers the HEL beam towards its target and maintains the aim is a key component of such an HEL system. 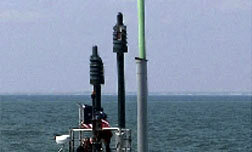 Previous beam directors developed for land-based or airborne use are too large for submarine use and are not submersible. A new beam director that is compact, submersible and tolerant of the high power incidence levels is needed. OPC has designed such a beam director with the right form factor for insertion into a submarine mast. This beam director can track the target and aim an approximately 12-inch diameter beam onto the target. The beam director can optionally contain adaptive optics components to condition the wavefront of the HEL beam and compensate for the atmospheric distortions that reduce beam effectiveness in a maritime environment. Tactical and long-range HEL systems are set to transform military operations in all services in the coming decades. Compact and conformal designs, such as those enabled by the OPC HEL beam directors, promise extremely lightweight, high performance, and cost-effective options for HEL weapons over the water or in the air.